A thought on wine keys for your restaurant/club/bar: buy them on eBay! I have been at the club for almost three years now, and each shutdown, I buy a large lot of wine keys on eBay for our servers and bartenders. I think the first lot I purchased was $25 with shipping, and the second was $30. Get this, the lots are airport confiscations! How awesome is that?! However, it does state in each description that the quality of the keys cannot be guaranteed... but I figured if even half of them were usable, it would still be worth it. And the first two I received were pretty good gambles. 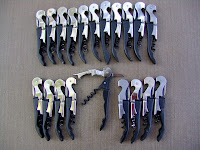 This last time, I had requests from the staff for specifically pull-tab wine keys, which the other lots had some, but not many in that 100 (not that they were bad wine keys, just not very many pull-tabs). So I found a "Buy It Now" lot on eBay for 20 pull-tabs for $35 with shipping. Still not a bad buy, considering my equipment distributors charge about $4-6 each. And each one of these pull-tabs that arrived are in really good shape. Not brand new, but in perfect working order. I told the staff, though, not to lose these ones. 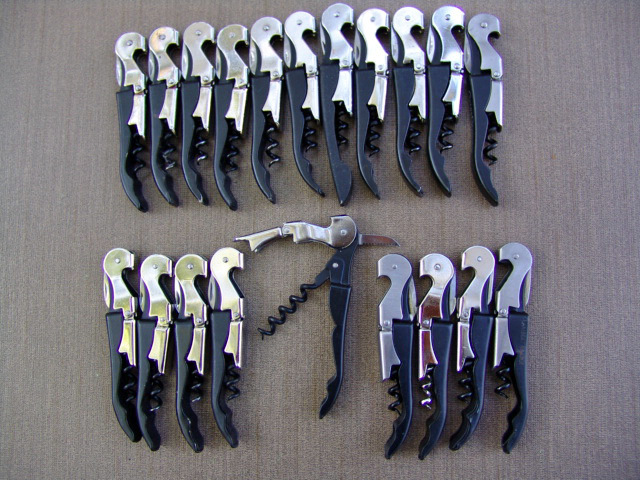 Go to eBay and search for wine key lot or corkscrew lot, and see what comes up. And if you don't see what you're looking for, check back in a week or two... some TSA employee is bound to find 100 wine keys somewhere... on someone... some... where.